In their technical nature, humans tend to culturally hyper-compensate for what they feel they have lost. This media archaeological talk discusses two case studies. The first concerns contemporary art forms that employ biotechnologies in actual practice. Paradoxically, they emphasize both their ‘aliveness’ and authenticity on the one hand, and their explicit technicity and artificiality on the other. Therefore, the terms ‘life’ and ‘nature’ – both terms only putatively non-technological, need to be disentangled. We encounter a similar problem with the culturally pervasive greenness trope: Aliveness and greenness are linked through ‘biofacticity’, the idea of biological artifacts that at the same time grow and indeed are technically constructed from the beginning – the concepts ‘green’ and ‘nature’ need to be uncoupled as well. ‘Green’, symbolically often associated with the ‘natural’, will be addressed as the most anthropocentric of all colours, crucial in human self-understanding beyond colour, as percept, medium, material biological agency, semantic construct and ideology. Jens Hauser is a Copenhagen and Paris based media studies scholar and art curator focusing on the interactions between art and technology. 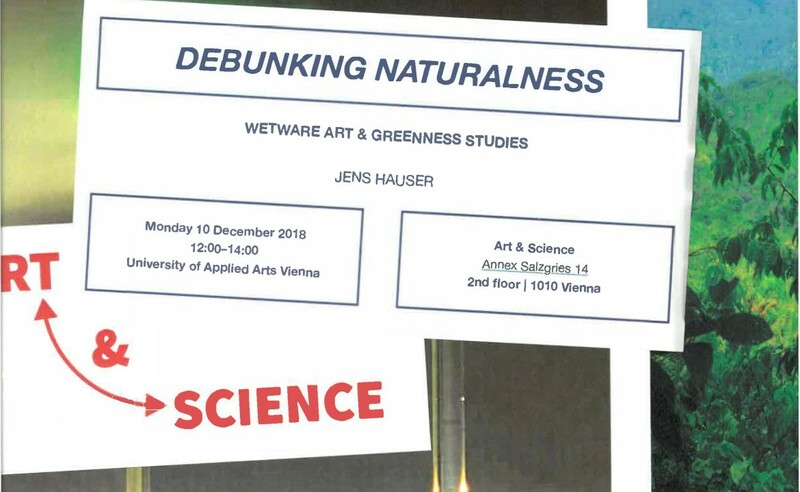 He holds a dual research position at both the Department of Arts and Cultural Studies and at the Medical Museion at the University of Copenhagen, and directs the (OU)VERT research center for Greenness Studies. He is also a distinguished affiliated faculty member of the Department of Art, Art History and Design at Michigan State University, where he co-directs the BRIDGE artist in residency program. Hauser is also the chair of the European Society for Literature, Science and the Arts’ annual 2018 conference in Copenhagen. His curated exhibitions include L’Art Biotech (Nantes, 2003), Still, Living (Perth, 2007), sk-interfaces (Liverpool, 2008/Luxembourg, 2009), the Article Biennale (Stavanger, 2008), Transbiotics (Riga 2010), Fingerprints... (Berlin, 2011/Munich/2012) Synth-ethic (Vienna, 2011), assemble | standard | minimal (Berlin, 2015), SO3 (Belfort, 2015) and Wetware (Los Angeles, 2016). Hauser is also a founding collaborator of the European culture channel ARTE and has produced numerous reportages and radio features.